We had an interesting talk about officer safety at this months MACA meeting in Leominster. The topic of discussion revolved around a recent FBI report that showed that while most serious crimes are down across the country, the number of police officers killed in the line of duty has gone up. This story on CBS News discusses this alarming trend and how we have recently been hit close to home by one of these tragedies. You may recognize John Miller from his excellent presentation at our 2010 conference. Our discussion came about because our outstanding VP of Administration Tiana Antul had seen this report (Not this same news story but a similar story about this report) and sent an e-mail to the board regarding how this report made her feel and how it was so relevant to our upcoming conference and keynote speaker, Marcus Young. We all decided that while there is a possibility that doing good analysis may be putting our officers at increased risk that we all have to continue doing the best we can to provide important tactical information to our officers and look at other things we can do to make them safer. I would like to share some resources that you can mention in your bulletins and I hope that you will pass along these free resources and some training announcements to your officers and tactical instructors. I also hope that you will check out these resources yourself and think about ways in which we can further enhance officersafety within all of our jurisdictions. If you have anything you would like to add to this conversation please share on the MACA-L. The Valor Project is designed to enhance officer safety. They have free resources on their website and are currently touring the country to give training. Calibre Press has an excellent newsletter that all officers should subscribe to. They have been the leaders in officer survival training for 3 decades now with their Street Survival Seminar and their 3 Masterpiece books on the topic. Force Science is the cutting edge in research on officer involved shootings and use of force incidents. The Force Science Newsletter is free and the information it provides is excellent. 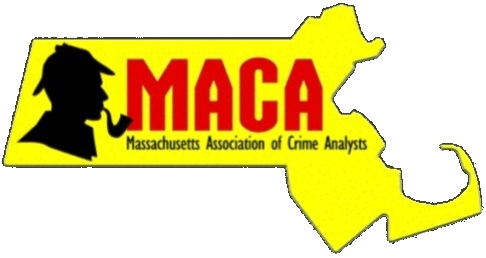 Welcome to the new website for the Massachusetts Association of Crime Analysts. This section will be used to announce new initiatives, partnerships and programs.